Beltane greetings, OBOD Ogham scholars. Here in America there is non-Druid pseudo-academic information presented by Dr. Barry Fell that says that seems to contradict what OBOD indicates regarding the use of Ogham. He says that the "earliest forms of Ogam . . . like Hebrew and Arabic. . .were written without vowels." Yet, OBOD teaches that the original alphabet comprised 20 letters (15 consonants and 5 vowels) with 5 diphthongs added later. My impression is that Barry Fell, who was a marine biologists not a language scholar, is perhaps barking up one of those fake cinematic trees. Hopefully, this is the right forum for someone a bit more knowledgeable to comment. It's described elsewhere that this "Ogham" find in West Virginia has nothing to do with Ogham at all*. Last edited by Lily on 17 May 2011, 13:01, edited 3 times in total. Thanks, Lily. This question, while similar, is not the same. I'm asking for verification on vowel usage by the Druids using Ogham. I believe they did but am no expert and want to have an expert verify this for me. Your safest bet is to take it all with more than a pinch of salt. Both the american and OBOD variants. It is probably all made up by people with a lot of imagination, call them charlatans, or harmless poets. The best thing to do is use your own imagination instead of 'following' what others did with theirs. Think 'here and now'. Ogham can teach you a few things. Like the use of symbolism, or how letters can hold certain meanings, how you can combine them into magical words, or how to use all that for divination. The nice thing about OBOD-ogham is that we link it to certain trees (something made up by Robert Graves I believe), so that your journey through the ogham can also become a journey through the woods when you find all of these trees IRL. Which can be a huge lesson in connecting to nature in a spiritual and very practical way. The principle of ogham is really just like our own alphabet, or any other alphabet, except that we are so terribly familiar with that that we don't see the magic in it anymore. In that sense it is a good magical/spiritual lesson to step back to an unfamiliar set of characters with a sense of mystery attached and see what that can teach you. He says that the "earliest forms of Ogam . . . like Hebrew and Arabic. . .were written without vowels." Hmmm well the p-Celtic (Brythonic ones like Welsh, Breton and Cornish) and q-Celtic languages (Goidelic such as Irish and Scots Gaelic) are not at all related related to Hebrew or Arabic. If it means the earliest forms of writing, such as Sumerian, I don't know enough to say whether they were written with vowels or not. Certainly the earliest Ogham writing was written with vowels in it. 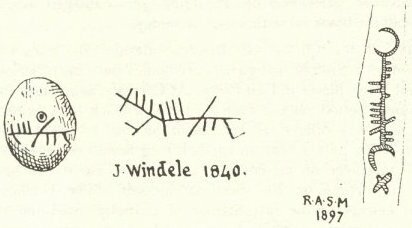 In the old ogham text there were links to trees, birds and colours but whether just for mnemonic purposes or for other reasons is not known, however, Graves perhaps over emphasised and embellished the particular link to the trees. Well, there's no need to call charlatan if it's about a purely factual question. There are ogham inscriptions (if not many), and there's literature describing them and discussing their interpretation /transcription completely unrelated to neopaganism or modern druidry. I'd start looking in current linguistic works about Old Irish. Sengoidelc : Old Irish for Beginners by David Stifter assumes vowels and refers to A Guide to Ogam by Damian McManus, 1991. The latter is also heavily quoted on http://en.wikipedia.org/wiki/Ogham. As with all matters of history and ancient languages, without a time machine we'll never find the final proof, but vowels in Ogham seem (from my 10 minute research) agreed upon by scholars at the moment. Edit to add: for a more detailed overview of the changes within the Ogham period, i.e. the differences between the oldest and the newest known inscriptions, I doubt anybody here (unless there's an Ogham scholar present, apologies then) is able to give you a better answer than a good library can, possibly with inter-library loans. This includes me, of course. Well, there's no need to call charlatan if it's about a purely factual question. It is never a purely factual question here, there is a spirituality attached, and for some people (like me) it is important to be provided with clarity about what is truth and what is fantasy in that spirituality. To prevent disappointments later on. But don't worry, only those who want to see will see, that is how it works. I think two things are being mixed here. an alphabet, lending itself exquisitely for inscribing into stone because it consisted of only straight lines. there's the modern interpretation, partially spiritual, partially romantic-historical - based on a medieval manuscript, possibly giving a method of memorizing the alphabet, by associating it with trees (or birds, or ....). (It all comes together at the end - Ogham sticks may indeed have been used for divination, according to one irish tale). Thanks all for the lively discussion and Lily for the links above! I hope this didn't distract you too much or take too much time. From my research, of which I wrote an article for a group here and am updating it for the OBOD archives, I found clearly that Fell and his group misrepresent and misuse information for their own charlatan purposes, though they believe their own hype. As a Druid, I use the faculties of the mind to cut through the hype and get to the truth of the matter. I love this aspect about Druidry - it feels good and it thinks well! Not one or the other, both. I just couldn't ascertain by myself if what I was seeing on ancient stones used vowels in Ogham or not. To my eyes, they did but I just needed confirmation. I feel much more on solid ground now. Again, thanks to all. Somewhere on the forum I posted a note on a book by a genuine expert in ogham, which I am definitely not. Hopefully you can find it without too much trouble. Some guy spent 20 years working out the details. I just couldn't ascertain by myself if what I was seeing on ancient stones used vowels in Ogham or not. To my eyes, they did but I just needed confirmation. The Ogam type markings that Barry Fell explores as Ogam are certainly interesting. Scholars consider the markings 'outside the genre' of Ogam and Fell makes a complete hash of 'interpreting' them to suit his theory. They might however be worth a more 'objective' study by someone with an open mind. Thanks for your contribution. Do you have a personal explanation for the USA markings as a matter of interest? from what little I have seen of them they certainly look like a form of tally (which is what Ogam is). Tally scripts are near universal. Ogham is a tally? I thought most known examples are more like land markers. Saying whose land it is. You see, you actually had to be able to read to read Ogham, whereas tallies are non-alphabetic to my knowledge. Isn't it thought that Ogham arose only AFTER latin was introduced to the isles? and is from Ireland which makes a whole lot more sense! Y/W - nothing really, I am not an archeologist or linguist. Just very interested. To me they look like stone knives might have been polished or sharpened on the rock. or, actually they do look quite "arranged", especially those downward arrows, perhaps those ARE tallies? [/quote] Ogham is a tally? I thought most known examples are more like land markers. Saying whose land it is. The one thing nearly all scholars are agreed on is that Ogam was originally a tally script/system (this is made clear in the medieval manuscripts eg for counting pigs etc) it's use would have been on wood before stone. The use on stone, as you say is for names/territory. Latin was introduced to the British Ilses quite early-certainly pre-Christian, most scholars think Ogam was based on Latin-I have explored a full range of options in my book including Phoenician-I like to keep an open mind on it. Lol ref the bead-indeed-but still the form is very similar. Ah, I never looked at it that way, it makes a lot of sense then to obsess so much about the assignments as the book of (?) Ballymote does. Tallying livestock. obviously the actual tallies wouldn't have survived...? the location (Boone/Wyoming, VA) is really far from Vinland, you realize that? 1500km south and 200-300km inland. I'm not ruling anything out but... Ijust think the likelihood is really low and since it looks nothing like Ogham OR runes... neh. As for tallies surviving...it's a good question, I enquired before at the National Museum but got no reply-must follow it up. The tally was used by the exchequer right up into the 19th C! The Houses of Parliament was near destroyed when they went to burn all theirs.